I love how I was walking thru a christian theme! I love that God saved Noah and gave us another chance! Then He sent Jesus so we can live forever when we are one day resurrected! The ride doesn't say all this but it makes me think of it because I read the Bible. Very emotional for me to walk thru this and hear Noah singing and stuff...wow if u r a Christian check it out... if not u may want to go on it anyway since its fun and thrilling because u r rocking to and fro as u try to walk! I love that part as well. This is a very good fun house, it's fun, rerideable, nicely decorated, has a large capacity, and long duration. What the world was this? A funhouse or scary house? Or was it just a nonsense house? It was one of the worst things I&#39.ve ever been on. Im not a big fan, of this walk through dark ride, since they re-themed it in the mid-90s. I liked it better, when the entrance,was in the front,and you entered,via a whales mouth. The disappoinment of the park for me. Compared to Blackpool Pleasure Beachs version, the only other time I have been on one, its pretty bad, and the whole elevator at the beginning/ submarine (I know thats not the exact term, but I cant think of the other at the moment) at the end not only detracted from the experience, but felt fake, out of place, and very corny. 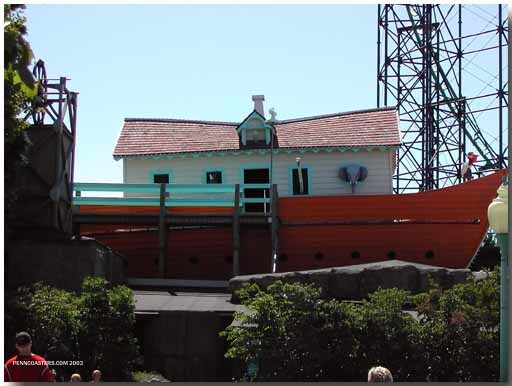 There were a few good parts in the actual "ship" area which saves it from being rated even lower, but even so, this is a completely skippable ride at Kennywood, imo, unless you havent ridden one before and would really like to at least see what the general idea is. From the outside this attraction looks kind of strange and begs for a closer inspection. I checked it out and I was a little disappointed. The elevator scene at the beginning of the attraction is well done and the elevator operator did a good sales job to get things going. Most of the walk through effects stuff is quite boring and the animal figures have seen better days. The ever rocking boat effect is fun and I liked the exterior walkway. The ending is also well done. For overall uniqueness and historical value, Ill bump it up rather than down a notch. I think this is really a 6.5 type of attraction rather than a 7, though. Its pretty fun, but some parts need updating slightly. (such as the stuffed animals in the begining of the arc or the shaking floors that have nothing to do with the story at all) But if you are annoyed with the low-budget effects, go on the one in Blackpool then ride this one. Youll appreciate it more. I dont really like it because it has gorillas that I thought were going to pop out and attack you. I wasnt a big fan of this ride when went on I went on it last summer, but I respect its age and how its the only one left in the USA. Anyway, I dont like the things at the beginning or the end. SPOILER WARNING!!! At the beginning, you go into an "old and rusty" elevator. A speaker above says something like "This elevator hasnt been used since an archeological expedition blah blah blah..." At that time I was totally obsessed with Ancient Egypt and archeology and I believed it... But then towards the end of the speech I got this weird feeling and I was like "oh great, this isnt real. I hope my brother (5 years old) doesnt get scared..." About 30 seconds later the voice started to, erm... Warble? and fade out. The lights turn off and the lights on the side of the elevator lights start blinking and the elevator starts getting all jarred around. I looked over and my little brother had this face on, so I was like "Alex, its like the Exterminator, its just fake" and my sister and I were trying to comfort him. The doors of the elevator opened and you go into all these moving floorboards, (mega fun) and then a bunch of typical dark ride stuff. At the end of the ride, you walk into a small room and everybody started running to the wall. It was my first time on Noahs Ark and I was really confused but I followed anyway. Then water started squirting out of the overhead pipes with signs that said "HIGH VOLTAGE". From above, you hear something like "Hello, this is Phil from Kennywood maintenence. Please do not panic, we will get you all out soon". The wall starts caving in on you and he says "Whoa, whats going on in there?!?!?!" At this point, my other little brother woke up scared too..." Some water sprays on you and the doors open up, thats it. Pretty lame, kind of corny, and really weird. Sorry for the long post/spoilers.